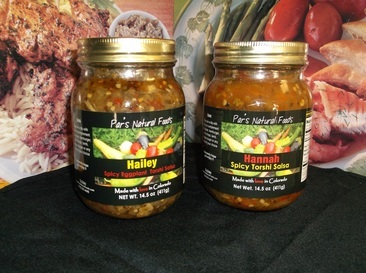 Hannah- With a large taste reliance on the famous Pueblo green chiles, Hannah is the more mild of the two salsas, yet still has a spicy bite to it. Hannah's made with lemon, vinegar, celery, garlic, tomato, canola oil, carrot and different Persian spices. Hailey- Hailey is the more spicy salsa of the two, though both of them have quite a kick. Hailey relies on eggplant as it's main flavor. Along with eggplant Hailey has lemon, vinegar, garlic, tomato, onion, canola oil and different Persian spices.